My first job in the Salesforce consulting world was literally with a company called “Idle Tools.” The name confused a lot of people but owners picked that name for a reason; they saw so many businesses that weren’t taking full advantage of Salesforce even though they were paying full price. To this day, the vast majority of businesses that I consult with aren’t using Salesforce to it’s full potential. While there is practically a limitless number of business applications for salesforce, I want to take a look at some practical steps aimed towards increasing functionality in common areas that aren’t touched upon in most initial implementations of the system. In today’s competitive environment, every business must be a customer centric organization. Anything less than stellar customer service can lose customers in a heartbeat. So it’s important to make sure that issues never slip through the cracks. Implementing Salesforce Cases can allow for tracking of any type issues. Maybe it’s a billing issue, a new feature request or a troubleshooting task. 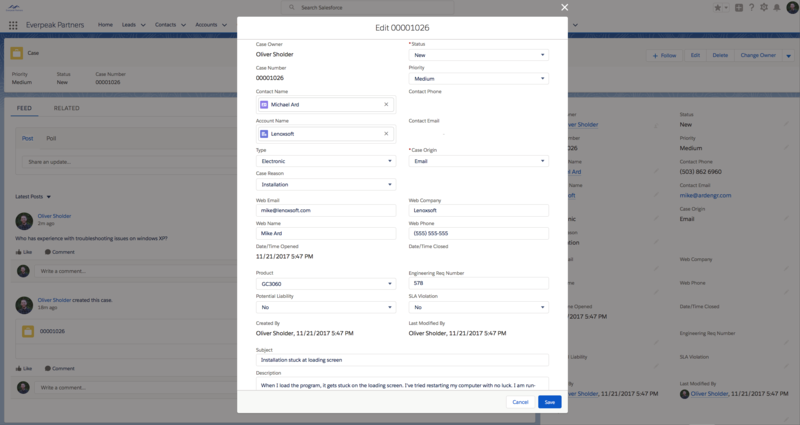 Using Cases to tie in the support arm of your business with Salesforce Accounts and Contacts will connect your data so your reps can see a bigger picture. The replacement of siloed systems with integrated systems is a move forwards creating a ‘single source of truth’ where all data can be gathered in one spot. Stop logging into so many different systems and stop duplicate data entry! Cases can be easily integrate with web forms without writing a single line of custom code. When someone submits a support ticket, the system can automatically route the case to the right rep depending on the variable we choose – who is a specialist in the type of issue, who has the most bandwidth or who is in the region (for example). Information about how cases are resolved can be shared and publicly accessible within the organization. And since this data is in Salesforce, we have excellent reporting capabilities. Useful insights can be gleaned from the data when you see it complied together which can allow for mitigation of common support cases with things like a FAQ page or a change in the process of delivering the product or service. Salesforce can be used to track the status of a project and deliverables that are a part of projects. Unlike cases which is a standard object (but a lesser used one), the objects which I’ve named “Projects” and “Time Tracking” are completely custom. No code is required to create these objects but they are extremely powerful and add a whole new dimension to Salesforce. Users can own projects, teams can be tied into projects, deliverables can be tracked against due dates etc. The whole nine yards. For businesses that provide services billed on an hourly basis or even those that want to understand where their employees allocate their time, building a time-tracking system in Salesforce can be a great solution. 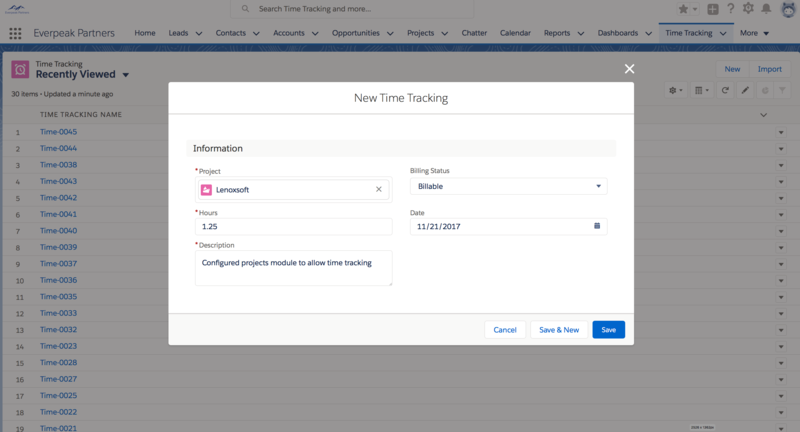 When an opportunity is won, a project can be automatically created and tied to a “time tracking” module log time against projects or segments of the projects. Among a plethora of useful metrics, formula fields can be used to calculate how many hours are left on a project, the average number of hours billed per week or the number of hours each user is billing. Top this off with reporting and you have an excellent tool for organizing and understanding employee utilization and time investment into different projects. 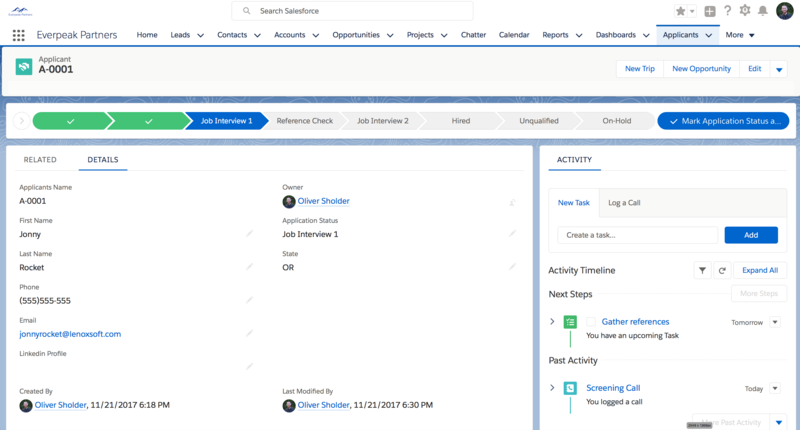 Just like the way Salesforce opportunities tracking progress towards closing a sale, an ATS system built in Salesforce can track progress towards filling open positions. The ATS can a status field with something like: New, Resume Collected, Job Interview 1, Reference Check, Job Interview 2, Hired, Unqualified, or On-Hold. Fields tracking certifications, education, references, previous roles and more can be build as custom fields. I’ve seen clients build their ATS into Salesforce then ditch the old disconnected system and the monthly fees they paid for their old ATS system. Better connected data and a cost savings. That’s a real win / win situation. With the data in Salesforce, once they are hired, they can be converted into an employee in your database without copying any information. Emails and job alerts can even be sent from Salesforce to applicants who meet a certain criteria. A related object called “Job Openings” can be created which can track all open positions. This can turn into a comprehensive system that a human resources team can thrive in. In conclusion, these are just three practical uses of Salesforce outside of the sales arena but there are an unlimited number of other ways the system can be used. If you are interested about learning more, I’m happy to chat. 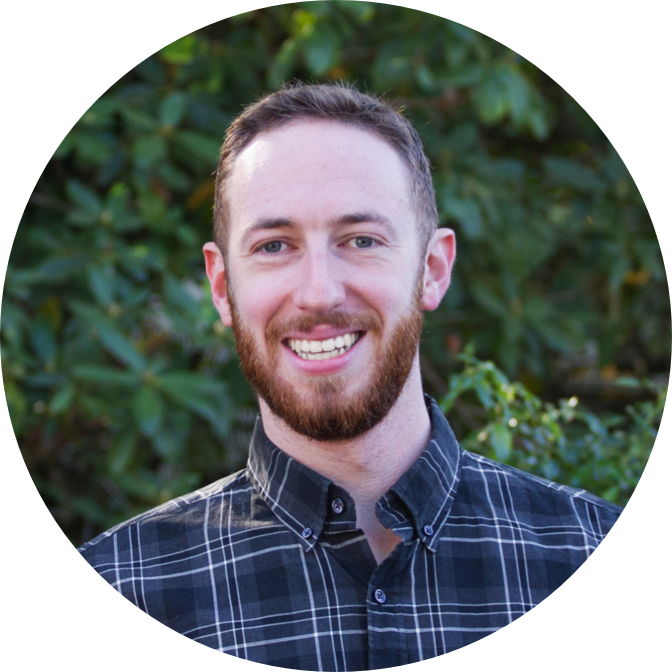 You can email me directly at oliver.sholder@everpeakpartners.com.